Today is the 524th anniversary of the beginning of the voyages of the Santa Maria, Pinta, and Nina, or the anniversary of Christopher Columbus’s famed quest for Asia. Many people- and almost all textbooks- regard Columbus as a hero who changed the course of history. However, very few people know (and are willing to recognize) the full history of Christopher Columbus. For those whose memories of history are a bit muddled, Christopher Columbus was the famed adventurer who accidentally sailed to South America in a bid to discover an easy ship route to India. He made 4 voyages there from 1492 to 1502, each one being of less importance. When he first discovered the New World, he was convinced that he had made it to India, and then named the natives ‘Indians’. And as most everybody knows, he immediately enslaved them and subsequently caused the deaths of tens of millions natives through both physical punishment and the spread of foreign diseases such as smallpox. These numbers aren’t exact, as scholars use context from ancient writings to gather numbers, but most agree that the population was around 50 million people. Now, most people prefer to overlook Christopher Columbus’s enslavement of millions of people and the lesser-known fact that he died in complete disgrace so that they can praise him for ‘discovering America’. Except he didn’t discover anything. There were millions of people living in Central and South America and the islands he visited. The people who had been living there for thousands of years are the ones who discovered it, not the man who enslaved them and infected them with a handful of diseases they had never come across before. Also, Christopher Columbus never stepped foot onto North American soil. The first European to ‘discover’ America was Leif Eriksson when he sailed to Canada around 500 years before Christopher Columbus. Christopher Columbus’s enslavement of people was said to have killed millions of people. A majority of the slaves were Taíno, who were the first group of natives that Columbus discovered. According to Wikipedia, upon discovering the Taíno people, he wrote in his journal, “...They ought to make good and skilled servants, for they repeat very quickly whatever we say to them. I think they can very easily be made Christians, for they seem to have no religion.” Around 90% of these deaths are attributed to disease, but Columbus had no reservations about punishing natives. For example, Columbus returned to the first colony he set up, Hispaniola, to find that both natives and colonists were rebelling because of the lies and mistreatment. Word of the poor conditions got back to Spain, which caused the monarchs to send ships to arrest him and strip him of his title of governor of Hispaniola. 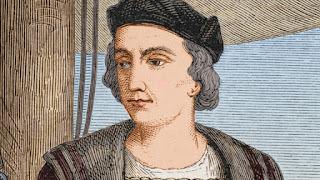 After his shameful return to Spain, Columbus faced the court in Spain where he admitted to many of the charges. However, the charges were dropped and Columbus was stripped of his riches and title. Columbus eventually made one more unsuccessful trip, but never regained his title or riches, and died with very little to his name. Columbus is known as both a hero and a murderer, but it is up to you which side you choose. Is Christopher Columbus a hero, a murderer, or both? While a unanimous answer will never be reached, forming your own opinions is an important step in educating yourself.